SEATTLE – To feel the heartache, you must find the biggest heart. And on the first night of the NBA Finals it literally and figuratively belonged to Lorin "Big Lo" Sandretzky, who sat in the corner of a bar owned by former Seattle SuperSonics forward Shawn Kemp and stared sadly at the television. Big Lo is something of a legend in Seattle. He calls himself "Seattle's Biggest Sports Fan," and at 417 pounds he probably is. When Seattle sports teams arrive home from long trips, Big Lo is the first person they see, standing alone by the side of the hanger. Once, when the Sonics flew back in a snowstorm, the players climbed off the plane to discover Big Lo had shoveled their cars from out of the drifts. That was back when Sonics coach Nate McMillan bought Lo's Sonics season ticket in the third row behind the basket. It seemed to McMillan the least he could do. But that was also back when the SuperSonics existed, before they moved to Oklahoma City in 2008 and became the Thunder and before the Thunder made the Finals, which was tearing Big Lo apart. "I'm like a lost little kid," Big Lo said. "When you're a kid you try to make sense of things. This is one of the things I can't make any sense of. It's like losing your favorite childhood toy or a friend." 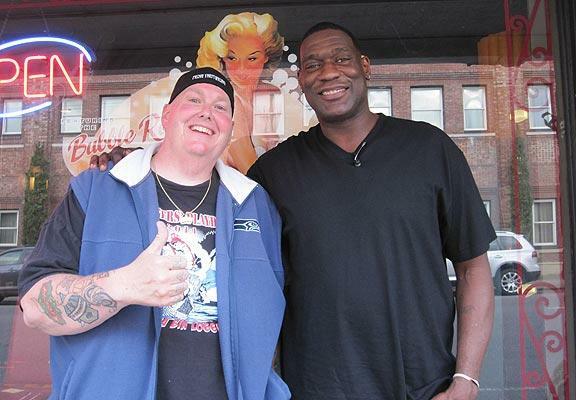 The bar is named Oskar's, the first three letters of which stand for "Oh Shawn Kemp." A few people around Big Lo watched on the television as the arena announcer in Oklahoma City read the introductions of players who will never again be theirs. An early evening sunlight trickled through the windows. A man sitting at the bar wore a red, floral skirt for seemingly no reason. Nobody much noticed. In the background, Kemp moved between tables. There were more important things to do than watch somebody else's basketball team. Only Big Lo stared at the screen. "I know so many people who are telling me to get over things," he said. "I don't think I can. My mom died when I was 7. I went to my first Sonics game when I was 8. I've cried about it. I've gotten pissed off about it. I wanted to lash out and say bad things about it. "Now I don't want to think about it. It's not OK."
He took a long drag from the iced tea in front of him. These have been a bad few days for those who still love Seattle's first professional sports team, the only major one to win a championship. Accepting the Thunder in the Finals has been hard enough, then seeing the team's owner, Clay Bennett, hold the Western Conference championship trophy aloft last week caused even more angst. Hard too is the thought that Seattle might be close to getting a new arena approved and a team to wear the Sonics gold and green again, because they worry the proposed arena might not get enough support and the best chance might go away. And even if it does get built and a team arrives, it will be a team from somewhere else and Seattle will be doing to another place what Oklahoma City did to it. And how good does that make anyone feel? All of which means Big Lo won't stay at Oskar's for the end of Game 1. "I can't take this [expletive] anymore!" he will declare and head out into the twilight like so many others in a city that can't bear to watch. Later, Kemp will sit in the same seat, gaze at the monitor as the Thunder will win Game 1 and he will call them "The Sonics." He will laugh at this mistake and say that the great sadness for him is how good and how likeable the Thunder players are. He doesn't hate the team or the fans or even the owners. This was business. But how wonderful it would have been to still have a young Kevin Durant, what an inspiration he would have been to kids. "Half the people here feel they were robbed," Kemp said. He shrugged his enormous shoulders. What else do you say? The anger is never far away, burning in scorned fans who don't know who to blame more: Bennett, who was determined to take the team away all along; previous owner Howard Schultz, who had to know what he was doing in selling to Bennett; or NBA commissioner David Stern, who seemed strangely consumed with helping Bennett pull the franchise out of Seattle. You feel the rage in people who will avoid downtown buildings because they contain multiple Starbucks, Schultz's iconic franchise, or glower at friends and co-workers who clutch warm Starbucks cups without recognizing that doing so signals support for the man who gave Bennett the team in the first place. 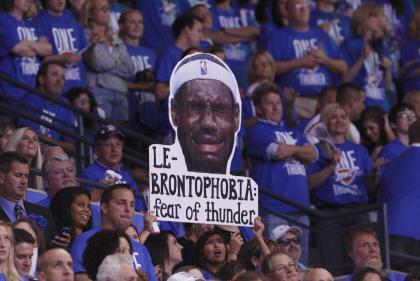 These are many of the same people who cringe when they watch sports highlight shows and hear the announcers say this is the fourth NBA Finals appearance for the Thunder, as if Bennett gets to take their 41 years of suffering and elation and hang it like some hunting trophy above the fireplace in his den. At times the hate can't help but spill out. And so 30-year-old Seattle businessman Erik Madrid sometimes picks up his phone, calls Bennett's Berkshire Hathaway, chooses Option 1 at the prompt – Bennett's line – and fills the owner's message box with all the hurt that festers inside. "I'm sure my mom wouldn't be proud," Madrid said. "But, oh well." During the Sonics' last season at KeyArena, he said he went to a custom jersey stand and convinced the two workers there to make him a home Sonics jersey with the name "C Bennett" and the number "666" on the back. Shockingly, he said, they agreed to do it, giving him a small measure of satisfaction that Bennett's own employees made the jersey. "I'm a sports fan," Madrid said Tuesday as he stood in the lobby of the building where he works. "I'd like to go home and watch the Finals tonight." "But, I can't," he said. Seattle is different than many other places. People are passive-aggressive here, burying their fury before letting it roll out in other ways. It is also a creative city, one where folks tend to express emotions through poetry or song or in the case of four local filmmakers, a movie. It was through the Sonics' departure that Jason Reid, Colin White and Colin Baxter met Adam Brown. All had the same sense of loss. One day the thought occurred to them: Why not make a documentary about what happened? The resulting film, "Sonicsgate," is probably the most complete accounting of what happened to the Sonics. Among the old clips of Jack Sikma running joyously off the court in 1979 and Kemp dunking is a 1995 interview Stern conducted with a local TV station praising the refurbished KeyArena that a decade later he would all but declare unfit. "At first we said, 'Let's do a 10-minute YouTube video,' " Baxter said. It became a two-hour film. But the more the group looked into the matter, interviewing figures involved, the more they became convinced this was a hijacking. "Nobody had a place to go to commiserate," said Reid, the director. "We like to say it's not a movie, it's a movement." And yet it is more. It's personal – a sentiment best expressed by Baxter, the executive director, whose family has been in Seattle for close to a century. He grew up on Queen Anne Hill, which looms behind KeyArena. His great grandfather worked in the Lake Union boat yards. His aunt used to shoot late-night pool with Gary Payton at the Lake Union bar Jillian's. "This is all right in my backyard," Baxter said, his voice rising. "I get disgusted by the injustice. You're [expletive] with my family." Recently, CNBC bought the television rights to "Sonicsgate," broadcasting it to strong reviews in April. It will re-air the movie Friday at 9 p.m. Eastern. Still, the filmmakers keep pushing. They solicited donations from Sonics fans and bought tickets at Thunder playoff games in Los Angeles and Denver, holding signs that said things like "Seattle drafted Durant" and "41 years happened" strategically behind the Oklahoma City bench. They went on the radio in other vulnerable NBA cities warning fans that their teams could be snatched away as well. "We want fans to use Sonicsgate as a blueprint," Brown said. Nothing infuriates sports fans in Seattle more than the way Bennett stripped the team during his last years here, putting a wretched product on the floor, slowly building it to be good for when the team moved to Oklahoma. The smugness of Oklahoma City fans, who seem to be standing on third base and think they hit a triple, drives those here insane. For more than four decades people in Seattle had to ride the cycle of professional sports – patiently waiting for winners, celebrating success then losing stars, falling into an abyss and repeating the agonizing process of building again all while ticket prices climbed and climbed and climbed. Then to see the team yanked away before another great rise is almost too much to absorb. Fans still wonder why Schultz sold the team five years after buying it. Many see him as a man who betrayed his city, especially after vowing to be the perfect sports owner. His pushes for a new arena because rising salary costs rendered KeyArena obsolete had merit. But they came too aggressively and too early in his tenure. He bristled at public criticism he never had to face as a corporate titan and seemed surprised when players such as Payton didn't respond to his motivational attempts. "The players didn't care about Howard's story that he grew up in the projects of Brooklyn," said one NBA source. "They just wanted to get paid." "I think Howard became disenchanted," said Kevin Calabro, who was the Sonics' longtime play-by-play announcer. "He got coffee perfect but the NBA is imperfect. Baristas don't have egos, athletes do." In "Sonicsgate," former general manager Wally Walker, who was a part of Schultz's ownership group, revealed that they had been negotiating with potential buyers in Oklahoma City who expressed interest in keeping the team in Seattle. It was only at the very end of the talks, when the deal was all but done that Bennett suddenly appeared. The emergence of Bennett, who apparently had kept his involvement silent, caused many in the Sonics' group to question the sale. Still, the voting members decided 5-4 to sell to Bennett, much behind the urging of Schultz, who has declined to speak about the time. "He convinced himself Clay would stay here," a NBA source said. But at some point Seattle has to let go, even as fans still wonder why Stern barely worked to keep the Sonics here while working relentlessly to lock the Kings in Sacramento. His Seattle efforts always seemed draconian, demanding that taxpayers build a gleaming new arena … or else. Stern has told people privately that he was "insulted" by a Washington state politician and decided it wasn't worth his time to push for a new arena when it became clear that was the solution that would keep the franchise in Seattle. "It's unfortunate that the Thunder is so good right now, but it's fortunate that we have a reminder that when things are good everyone says they're good but when things are bad you can't turn your back on it," Kemp said. "You have to remember good things are around the corner. "Would we have turned our backs on the Sonics if we knew it would be like this now?" Kemp continued. "No. But when [the team] went it was a reminder of what you got." The energy now is shifting from anger and disinterest to getting another franchise. The best possibility emerged last year when a San Francisco hedge fund manager and Seattle native, Chris Hansen, signaled an interest to mayor Mike McGinn in helping to finance a new arena and bring basketball and hockey teams to town. At their first meeting, McGinn told Hansen that while he wanted a team to return that after two costly stadium deals for the Mariners and Seahawks that took more than $600 million of public money, city leaders couldn't do something that would take tax revenue from something else. The resulting proposal, an arena near Safeco Field, which will require up to $200 million to be repaid from taxes on construction and operation of the building, is probably the best the city will ever get. "We are not going to support anything that will put our general fund at significant risk," McGinn's spokesman Aaron Pickus says. Already the pushback has come from odd places: the Mariners – beneficiaries of a late 1990s government handout for Safeco Field – who raised questions about traffic. Also skeptical is the editorial board of The Seattle Times whose publisher Frank Blethen once earned the nickname "Ballpark Frank" for his exuberance over stadium projects. On Wednesday Hansen announced that Microsoft CEO Steve Ballmer and two members of the popular Nordstom family have agreed to join the bid. Arena advocates hope the new investors will be prominent enough to squelch the pockets of resistance. "Without equivocation this is the best shot [for an arena]," said one NBA source. "Seattle is next in line for a team, I believe." "What was lost was a city's history, a city's passion and a city's love," Calabro said as he sat at a table after hosting an event at a Seattle restaurant. He looked sad. For 21 years he told the story of the Sonics, his growling voice booming through drizzly winter nights, identifying the players by their nicknames. Payton was "The Glove," Kemp "Reign Man." Now he hosts a radio show, which he seems to love, but is not the same as making a team come to life. He worries about the coming arena debate. He wonders if this chance slips away how long will it be before another comes along. The longer a team goes without a sports team, he says, the more it adjusts to life without one. Eventually distance kills the longing. "Is four years long enough?" he asked. If not four then eight, 10, 12? When do people lose interest altogether? "This is the soul of your city, you have to fight for that," he said. But will it? Seattle has never been a scrapping kind of city. Seattle sports fans often don't challenge their team's ownership, demanding better the way those in other markets do. Politeness is revered here. Optimism is a virtue. Many local fans like to tout their diverse interests outside of sports believing they don't need to be absorbed in the identity of one team. Will they fight this time? "I don't know," Calabro said softly. "I think so." Arena supporters have planned a big rally for Thursday afternoon, two hours before Game 2 of the Finals. Kemp will be there. Payton is flying up from Las Vegas. Several other former Sonics will be around. "We need to assure [Hansen] that he will have our support," Kemp said. "For two weeks people have been talking about this rally," he said. "If we don't get 2,000-5,000 people it will all be for naught. Seattle fans are fickle. With no NBA it's tough to get the ball rolling. He looked down at his right arm where a tombstone with the inscription "RIP Seattle SuperSonics 1967-2008" has been etched in ink. He grew silent again. The implication was clear. On Tuesday evening they must have known how it might have been here, with the cars lined up and throngs of fans moving through the old 1962 Worlds Fairgrounds known as Seattle Center, everyone moving toward the silver-roofed arena rising from the ground. Outside, as he always was, the odd, balding man with the big gold tuba – the one everyone called Tuba Man – would clutch his horn and his Boomp Boomp Boomps would soon fill the sky. Inside, the announcer would implore everyone to "get on their feet for their Seattle SuuuuuuuuuuuuuuuuuuuperSonics!" And Squatch the mascot made to look like Big Foot would descend from the scoreboard clutching a Sonics flag. The roar would be deafening. The night magic. Seattle would be in love again. The Tuba Man is long gone. He died a few months after the team moved. Nobody has shouted "SuuuuuuuuuuuuuuuuuuuuuuperSonics!" in a long time. The man who played Squatch is now in Oklahoma City filling the costume of Rumble the Bison, doing whatever furry, two-legged bison mascots are supposed to do. And so it was quiet after the Sonics who aren't the Sonics anymore won their first NBA Finals game in 16 years. KeyArena was dark, its doors locked, the sidewalks outside empty. A maintenance man walked by. Otherwise, the only sound came from a young street musician standing halfway across Seattle Center. He held a saxophone in his hands, a small bucket rested near his feet. Into the night he played, the notes wafting across the silent paths and into the trees, reaching toward the Space Needle that loomed a few hundred feet away. His music would stand this night as a lonely requiem for the lost team and the city that might never replace it.